David Lakirovich was born in Brisbane, Australia, and started his violin studies at the age of three with his father, Jacob Lakirovich. David has taken part in various master classes with renowned violinists such as Felix Andrievsky, Nelly Shkolnikova, Jose-Louis Garcia, Pinchas Zukerman,Victor Tretyakov, Maurico Fuks, Haim Taub, Pavel Vernikov, and Michael Frischenschlager. His teachers have included David Zafer in Toronto, Arkadij Winokurow and Boris Kuschnir in Vienna, Vadim Gluzman and Shmuel Ashkenasi in Chicago, and William Preucil in Cleveland. David has performed in many recitals and concerts in Australia, USA, Canada and Europe, including solo performances in Weill Recital Hall in Carnegie Hall, along with performances with the Calgary Philharmonic, Scarborough Symphony, York Symphony, Downsview Symphony, Chicago College of Performing Arts Symphony Orchestra, and the JVL SSPA Festival Orchestras. He also performed in the “Young Stars of the Young Century” concert in George Weston Recital Hall for the Vladimir Spivakov International Charity Foundation. He performed in a Stradivari Society concert in Chicago, playing on the 1692 ‘Lord Falmouth’ Stradivari. He has also performed solo on Chicago WFMT 98.7 Classical Radio. An avid chamber musician, he has collaborated with Peter Salaff, Shmuel Ashkenasi, Ilya Kaler, Mark Kosower, Atar Arad, William Wolfram and Vadim Gluzman. He has also collaborated and performed with ensembles like the Pacifica Quartet, Cavani Quartet, and the Vermeer Quartet, and has performed in the Jupiter Chamber Players in New York and the North Shore Chamber Music Festival in Chicago. In 2014, his quartet in the Cleveland Institute of Music won “Quartet of the Year” in the Hvide Sande Festival in Copenhagen, Denmark. He has also performed on several occasions at the Instrumental Society of Calgary. David has participated in and achieved top honours in numerous violin and chamber music competitions around the world. 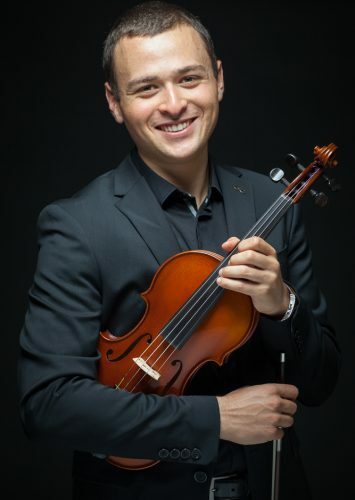 He was a participant in the Keshet Eilon International Violin Mastercourse in Israel for two summers, as well as the Pinchas Zukerman Young Artist Program in Ottawa. David Lakirovich was a faculty member of the Rochetta Ligure Masterclass in Palazzo Spinola, Italy, and has been on faculty at the Cremona International Music Academy since 2013. In 2017-18, he served on the faculty of the Mount Royal Conservatory in Calgary, and has given numerous masterclasses and seminars in their Advanced Performance Program. He also taught at the University of Calgary the same year. David completed his Undergraduate Degree at the Chicago College of Performing Arts at Roosevelt University in 2013 with Shmuel Ashkenasi and Vadim Gluzman, and his Master’s Degree at the Cleveland Institute of Music in 2015 with William Preucil. He previously served as the Assistant Concertmaster of the ProMusica Chamber Orchestra in Columbus, Ohio, and played 3 seasons with the Calgary Philharmonic Orchestra (2 years as Tutti 1st Violin, and 1 year as the Assistant Concertmaster). He was also invited to perform as guest Associate Concertmaster with the Jalisco Philharmonic in 2015 in Guadalajara, Mexico under the direction of Marco Parisotto. David is joining the Vancouver Symphony Orchestra as the new Assistant Concertmaster in June 2018. Due to a generous gift by an anonymous donor in Boston, David plays on a 1923 Stefano Scarampella violin.